Get gently used clothes, shoes, and coats. 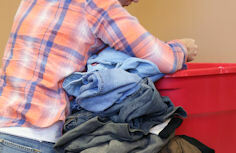 Help sort clothes, pick up donations, or serve clients. Donate your gently used clothing, shoes, and coats, or support us with a tax-deductible monetary gift. Our hope is to help people by providing clothing, coats and shoes to those in need. This process begins with generous donations of clothes and small household goods from our community. Every morning, donated items are picked up from local stores and collected from our drop-off bins outside our facility. Then on Monday, Wednesday, and Thursdays, many dedicated people gather to sort and organize those donations. Clothes, shoes, coats are then given out during scheduled 45 minute appointment times to those who need them. If you are in need, please contact us to schedule an appointment or get more information. 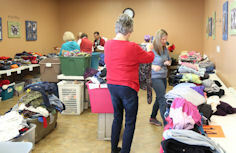 Threads offers gently used and some new clothing to those in need. To receive clothing you must make an appointment for one of our scheduled appointment times. We currently limit people to one 45 minute visit every three months where they can take whatever items they need. 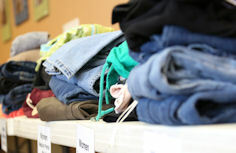 We offer clothing, underwear, coats, shoes, hats and gloves to those who need them. We just ask that anyone receiving clothing is considerate to others and that after three visits, they spend their fourth volunteering and serving others with us. Threads is a great opportunity for individuals, families or small groups to serve together. There is something for everyone to help with from picking up donations from stores, sorting and folding clothes, helping clients find what they need, or simply organizing and lifting the tubs of stored clothes. Join us - we need your help! In addition to donations we receive from local stores, we accept donations of gently used clothing, shoes, and coats from members of the community. You can drop off donations in our bins located behind our building at 33 Lawrence Ave. in Miamisburg at any time. You can also drop off clothing donations during our regular sorting and client appointment hours, if you are in need of a tax receipt. We are a 501(c)(3) non-profit and clothing and monetary donations are tax-deductible. Threads is open by appointment only.